A useful timing strobe can be constructed using high-brightness LEDs and a few common components. Ignition pulses from the number 1 cylinder high-tension lead are used to trigger the circuit via a home-made inductive pickup. Transistors Q1 & Q2 buffer and amplify the pulses from the pickup, which then drive the inputs of three Schmitt-trigger inverters (IC1a, IC1c & IC1f). Each positive pulse at the inverter inputs causes a low pulse at their outputs, forward-biasing D2 and immediately discharging the 6.8nF capacitor. When the capacitor is discharged, the inputs of the second bank of three inverters (IC1b, IC1d & IC1e) see a logic low level, so their outputs go high, driving Q3 into conduction and powering the LED array. After the pulse ends, the IC1a, IC1c & IC1f inverter outputs return high, reverse biasing D2. 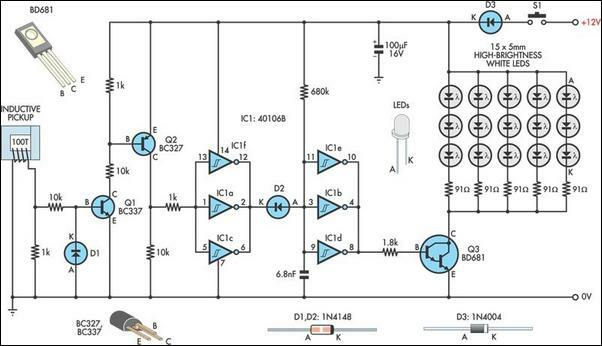 However, it takes some time for the 6.8nF capacitor to charge to the logic high threshold voltage of the inverters’ inputs, effectively stretching the initial pulse width and lighting the LEDs for the required amount of time. The pickup can be salvaged from an old Xenon timing light or made up from a “C” type ferrite or powered iron core large enough to fit around a HT lead. Some experimentation will be required to determine the number of turns required to achieve reliable triggering. About 100 turns of light-gauge wire proved sufficient on the prototype.